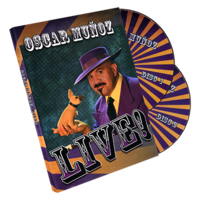 Today, when you order "Oscar Munoz Live (2 DVD Set) by Kozmomagic", you'll instantly be emailed a Penguin Magic gift certificate. You can spend it on anything you like at Penguin, just like cash. Just complete your order as normal, and within seconds you'll get an email with your gift certificate. Oscar Munoz gives you everything you need to entertain an audience! 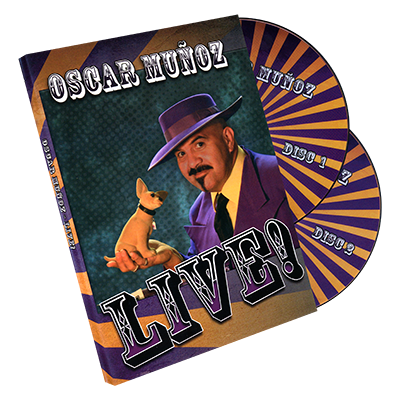 On this two DVD set, watch as Oscar performs his workers in his 50 minute show. The billiard balls, the rings, his 2 rope routine and more, plus a revealing conversation with Kozmo about developing comedy in magic. You'll be amazed at what's inside! This is an exceedingly clever way of dressing up Professor's Nightmare. Rather than doing the classic trick in the same old way, Munoz shows two sets of ropes: one set has three ropes of equal length and the other set has three ropes of different lengths. Under test conditions and as visibly as possible, Munoz causes the sizes of the ropes to transpose. Learn this elegant version of the Linking Rings from a master of the classics: Oscar Munoz. Oscar's routine uses just three rings and it showcases several original, visual penetration sequences. The routine is best suited to music or light patter, and it's the perfect length for a family audience. The billiard ball manipulation effect is a classic, yet good, PRACTICAL routines are almost impossible to come by. Oscar details a fun, comedic yet elegant routine that incorporates three color changes, a production sequence, and an elegant finale. He details all the props, moves, and routining that you need to perform this routine. Best of all, his routine is designed to look amazing from far away and quite close, so it's perfect for family shows or parlor audiences. One of the most popular parlor routines EVER is taught to us by Oscar, with all his professional touches. There is hardly ANYTHING that a magician can do to elicit a stronger reaction than to seemingly swallow a long balloon. This is the method to do it safely and entertainingly. Billiard Balls: Now personally I don’t care for billiard ball manipulation; however, in Oscar’s hands it’s a whole new ball game. This routine is fun, comedic and yet elegant at the same time. It’s perfect for family shows! 3 Rope Across: This is a clever presentation of Professor's Nightmare. Three same sized ropes and three different sized ropes change places across the stage. With a few kids and the right presentation I have seen this effect rock the house. Balloon Swallow: This is a popular routine and is a strong effect. Nothing too new here but it does round out the DVD. 2 Rope Trick: This is a fun one. It’s a practical multi-phased rope routine based on the original "Sand-Sational" routine from George Sands. This is a great personality piece and Oscar’s shows through. For a family audience it’s a powerful bit of magic. Linking Rings: One of the best linking ring routine I have EVER SEEN! It’s short sweet and elegant. This three ring routine is perfect for family audiences. I have adapted and adopted a version of this routine and added it to my family show. Oscar also teach three bonus effects including a linking balloon effect, a vanish and reappearance of a silk on a rope and the mouse bag. All three are great effects and make for a rounded out DVD set. So with all that said why didn’t I give it a full 5 star rating? The big reason I gave this set 4 starts was the interview. Just when the interview was getting good it was over. I wished that character development and show order/structure was discussed. Aside from that I truly enjoyed this set and I hope you do too. I just received this last week and spent the weekend learning from Oscar Munoz. The set of DVD's is great and if your a fan of Oscar Munoz you are going to love this set of DVD's. He is always on point. The live show had a few tech problems with the sound guy however Oscar uses these as a real pro would and adds comedy as a result of these problems. (if they were a real problem). The routines and explanations of each routine were well done and if you wanted to add one of them to your show you have what you need to do it here. The interview was a bit brief however we can all learn something when Oscar speaks about his experience and the thought process behind his magic. I personally believe that there is a great deal of value in this set of DVD's however they are a bit expensive. That said I would pay the price again as I am a big fan of this material and would recommend them to others. I would have given them a 5 star rating except for the concerns listed here. There is something for everyone in this product. Overall I am very happy with this product. Let me begin this review by clearly saying that I am a big fan of Oscar Munoz. I have always enjoyed meeting him at lectures and conventions. Oscar has always been super kind to me and always willing to share. With that said, I had no problem buying this DVD the second it came out - I was really looking forward to this release. However, I must be honest here and say that I was disappointed with this product. I wish I could have selected something different for he rating, but one is limited to two choices only. Since I could not give this a thumbs up, I have had to choose thumbs down. But, there are some things I liked here. The live show was filmed well, but the sound guy was not up to the task. More than once during the show the sound cues were messed up. I was also disappointed that the explanation section help back on some of the routines. The so called interview was mediocre at best. Take a lesson from the Bill Abbott interviews on his DVDs! Although I was not a big fan of some of the material in the show, especially the Strat-o-spheres for a family audience, Oscar does a nice job with the performance as he is obviously a real pro. I guess that is why I was surprised that this product was not better than this. I remain a big fan of Oscar's, but this could easily have been, and should have been, much better than it is. The cost is just too high for this DVD set.